Out of a chapeau Azure turned Ermine a hand holding a dagger, Proper. The Barclays, long thought to have come from Berkeley Castle in Gloucestershire, may in fact have originated at Berkley in the county of Somerset. In 1165 Sir Walter de Berkeley, first lord of Gartly, was Chamberlain of Scotland. 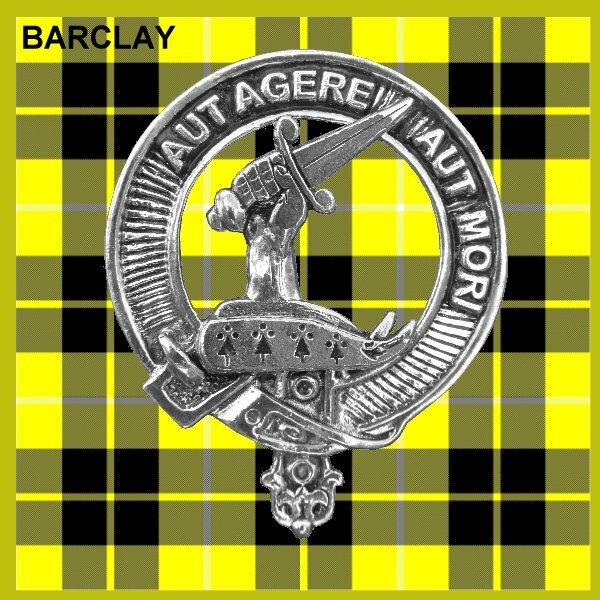 Until 1456 the chiefship of this name de­scended through males of the Gartly line, until it expired with Walter Barclay of Gartly, Canon of Moray. It then passed with his sister to the Towie-Barclay branch into which she married, which stemmed from the Chamberlain’s brother Alexander. On the death of the late Chief in California in 1967, the title passed to his cousin Peter Barclay of Tollie Barclay and of that Ilk (b. 1924). Meanwhile, early in the 12th century, a Theobald de Berkeley also settled in Scotland, and his descendant Alexander acquired the estate of Mathers when he married the sister of the Great Marischal of Scotland in 1351. Their son Alexander was the first to adopt the Barclay form of this surname. About a century later, their descendant David was compelled to sell Mathers; and so his son (also named David) joined the many Scots who went to seek their fortune in the Thirty Years’ War, and the comparatively few who returned, having found it. He acquired the estate of Urie near Stonehaven in Kin­cardineshire, but he was not destined to pass his retirement here in peace In 1648 Colonel Barclay of Urie took up arms for Charles I, and under the rule of Cromwell he was several times sent as a Scottish representative to London. After the Restoration in 1660 he suffered a brief imprisonment in Edinburgh, on suspicion of hostility to the new regime: and this trivial episode was to be the most significant of his life. Sharing his prison was the laird of Swinton, another Scot who had trafficked with Cromwell’s regime. In London, Swinton had become converted to the beliefs of the Society of Friends, and in his Edinburgh prison he converted Colonel Barclay to the Quaker faith. Barclay’s son Robert had been born in 1648 and brought up, as he later wrote, ‘amongst the strictest sort of Calvinists’. Later he was sent to the Scots College at Paris, of which his uncle Robert Barclay was Rector, and there became indoctrinated with Catholic teaching In both these sects I had abundant occasion to receive impressions contrary to this principle of love: seeing the straitness of several of their doctrines, as well as their practice of persecution.’ Thus wrote Robert Barclay after he had returned from Paris in 1664, embraced the Quaker beliefs of his father, and become their most eloquent apologist. In addition to his writings, he paid missionary visits throughout Europe, sometimes in the company of William Penn. Both men did much to increase the respect in which Quakers were held, and probably to lessen the persecution which Christians of all other sects generally inflicted upon them. The greatest contrast to the Quaker Barclays of Urie is that of the branch of the house of Towie which produced the Russian Field Marshal Michael Andreas, Prince Barclay de Tolly. He commanded the army which defeated Napoleon in 1812, three years before Wellington did the same at Waterloo.